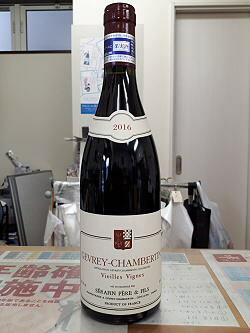 Aromas of sweet red berries, incense and spicy new oak introduce the 2016 Gevrey-Chambertin Village, a medium-bodied, ample wine with an open-knit but youthfully chewy framing of tannin, tangy acids and a chalky finish. With less flesh on its bones, this is showing its wood tannin more prominently than the higher appellations this year, but with a bit of bottle age it should round out. It's one cuvee, however, where a little less new wood might work well, without distorting the house style. The 2015 Gevrey-Chambertin Villages, bottled in February 2017, was matured in 70% new oak. It has a delightful bouquet with ample red cherry and wild strawberry aromas, just a touch of tobacco in the background. The palate is medium-bodied with succulent red berry fruit, hints of limestone and orange rind, all with very fine tension on the finish. This is a superb Gevrey-Chambertin from Serafin. The 2012 Gevrey-Chambertin Village comes from several parcels around the village. It offers natural blackberry and raspberry scents on the nose that has an impressive density to it. The palate is medium-bodied with crisp tannins on the entry. The fruit veers towards dark berry, boysenberry and blackcurrant with pleasant tertiary scents towards the finish. This is very fine for a village cru. From bottle, the 2016 Gevrey-Chambertin 1er Cru Les Corbeaux exhibits aromas of ripe cherries, candied peel, baking chocolate and toasty new oak. On the palate, it's medium to full-bodied, satiny and layered, with a deep core of cool and concentrated fruit, fine framing tannins and a long, pure finish. A definite success, it will reward bottle age. 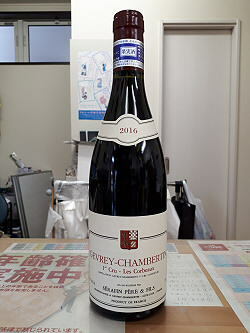 The 2015 Gevrey-Chambertin 1er Cru Les Corbeaux has a dense, slightly sultry bouquet that gradually unfurls and reveals blackberry, briary and wild strawberry aromas laced with granite and a touch of smoke. The palate is medium-bodied with supple tannin, fleshy and generous with a fine bead of acidity, fanning out with a sense of confidence on the minerally finish. I like the swagger of this Gevrey and it should age with panache. The 2015 Gevrey-Chambertin 1er Cru Fonteny offers plenty of brambly red and black fruit on the nose, just a touch of violet in the background. The palate is medium-bodied with grainy tannin on the entry, demonstrating more substance than the 2014 Fonteny and with more cohesion on the slightly savory finish. Good potential here. The 2009 Gevrey-Chambertin Les Fontenys is layered with dark cherries, flowers, spices and menthol. This is an especially fleshy, textured Gevrey. The showy personality of the vintage comes through, but there is also plenty of underlying structure and vibrancy. I especially like the intensity of the finish. Anticipated maturity: 2017-2029. The 2009 Morey St. Denis Millandes is fabulous. It boasts a great combination of rich, dark fruit and powerful structure. Today the wine is already starting to shut down, something that bodes quite well for the future. Mint, flowers, spices and licorice stain the palate on the deep, resonant finish. This is a brilliant showing from Christian Serafin. Anticipated maturity: 2017-2029. The 2015 Charmes-Chambertin Grand Cru has a very intense and powerful bouquet with dark cherries, blackcurrant, iodine and pressed violet aromas. The palate is medium-bodied with supple tannin, yes, a little oaky at the moment, but there is clearly sufficient fruit to back that up and it fans out gloriously towards the blood orange infused finish. This is wonderful.